Packing your child’s school lunch is the most effective method for ensuring they eat healthy food while at school; however, often these lunches are full of plastic bags and plastic containers. Munchkin has some solutions to this toxic packaging. 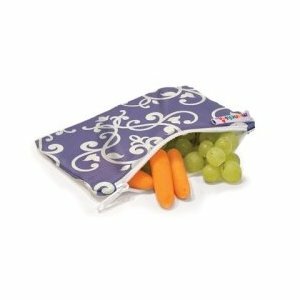 Munchkin Cloth Snack Bags: These cloth bags are really cool! We have reviewed other cloth bags that close with velcro closure and were handmade, but I do prefer the zippers on these bags. They can be thrown in the washing machine, and they avoid the use of ziplock bags in home packed lunches. Plus, I love the prints! The only drawback to this product is it is made in China. The toddler sport bottle is designed for bigger kids who want to look like mom and dad. These fun colored bottles are easy to hold also feature a kid safe clip. Top rack dishwasher safe and BPA free – and if it should drop you wont need a mop! It is spill-proof and leak-proof for no mess drinking. Would I buy these products? Absolutely yes on the snack bags. They only cost $7 for three bags, and they are super handy. I would not buy the plastic sport bottle; however, as I don’t trust any plastic anymore. BPA-free is not much assurance whens safer options exist, like [amazon_link id=”B0010XEMRI” target=”_blank” ]stainless steel[/amazon_link] or [amazon_link id=”B0052QOKXA” target=”_blank” ]glass[/amazon_link].